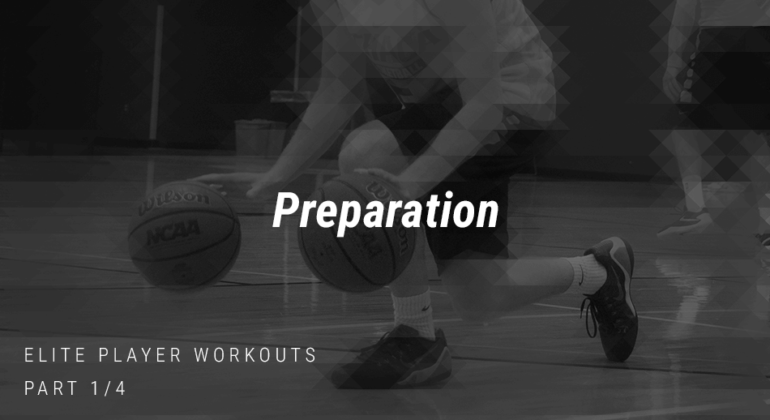 This is part 1 of 4 in our series: Elite Player Workouts. Before you embark on any of the drills and workout laid out in this guide, here are a few important notes to set you up for success. Take 5-10 minutes doing both stationary and progressive stretching. This will help loosen up your muscles and get a sweat going before your workout begins. 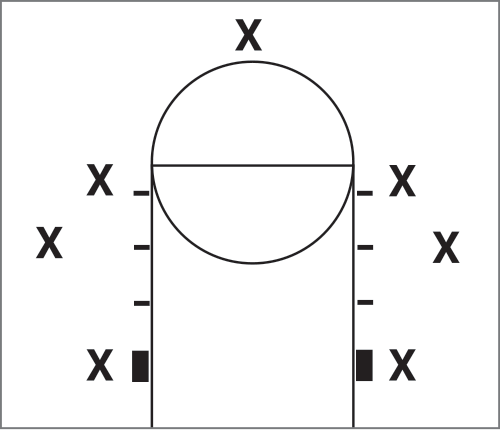 Throughout the workouts, we will reference the “7 spots on the floor”. 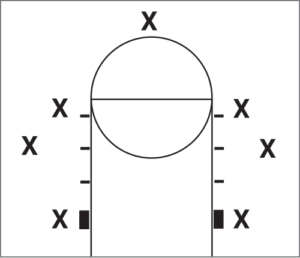 These spots are as follows: right baseline, right wing, right, elbow, straight on, left elbow, left wing, and left baseline. The 7 spots referred to throughout our workouts. The best way to go from a decent player to an elite player is the practice at game speed! This can be tough to do when in the gym by yourself. A great tip for pushing yourself is to not let the ball bounce or hit the floor more than twice, whether it is after a made or missed shot. This gets you moving at game speed, increases the number of shots you take and adds a conditioning component to every workout. Some of the drills we cover do require a partner, so get a fellow teammate to hit the gym with you. This will not only benefit both of you but most importantly your team! Your workouts should last 45-60 minutes. They should have a plan and be done at a high intensity. Select a few drills from each workout and focus on them. Preparation is key to getting the most out of your time in the gym. Focus on these key tips in all of the workouts and drills laid out in this guide and you will have a huge jump on the competition when you hit the court next season. This is part 1 in a series of posts put together to help you become an elite player, including a bonus section to ensure you get the most out of your time in the gym. Winning championships is tough! It takes daily hours dedicated to improvement, use this guide as a base for taking your game and your team to the next level!